To receive a PDF copy of this week's issue of The Intermountain News, either email us at news@northstate.news or telephone us at 530-725-0925 to begin your annual subscription for $24. The current issue of The News will be emailed to you on the Tuesday prior to the Wednesday publication date. 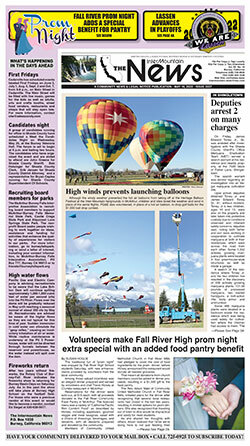 The Intermountain News is published every Wednesday morning for the communities of Burney, Fall River Mills, McArthur, Round Mountain, Big Bend, Montgomery Creek, Johnson Park, Old Station, Hat Creek, Glenburn, Cassel, Nubieber, Bieber, Lookout, Adin, Dana, Little Valley, Pittville, Cayton Valley, and Pondosa. The newspaper is published by Cright Incorporated, PO Box 1030, Burney, California 96013. Craig Harrington, president and publisher. The entire contents of The Intermountain News are copyrighted. This newspaper is judged a newspaper of general circulation under Court Decree #24204, filed April 27, 1959, and can accept legal advertising. USPS No. 266-560. Second class postage paid at Burney, California 96013. The most recent issue is posted here on Sundays. Click on the cover above to access it. To have the issue emailed as a PDF to you on the day of publication, telephone 530-725-0925. Cost is $2 per month, charged annually. To receive a PDF copy of this week's issue of the Shasta Lake Bulletin, either email us at slb@shasta.com or telephone us at 530-275-1716 to begin your annual subscription for $24. The current issue of the Bulletin will be emailed to you on the Tuesday prior to the Wednesday publication date.The Shasta Lake Bulletin is published every Wednesday morning for the communities of Shasta Lake, Mountain Gate, Lakehead and surrounding areas. The newspaper is published by Cright Incorporated, PO Box 1030, Burney, California 96013, with offices at 4138 Ashby Court, PO Box 8025, Shasta Lake, California 96019. The entire contents of the Shasta Lake Bulletin are copyrighted. The most recent issue is posted here on Sundays. Click on the cover above to access it. To have the issue emailed as a PDF to you on the day of publication, telephone 530-275-1716. Cost is $25 per year. Both the Bulletin and The News as well as After Five Magazine accept all major credit cards for subscriptions, classified, display and legal advertising. 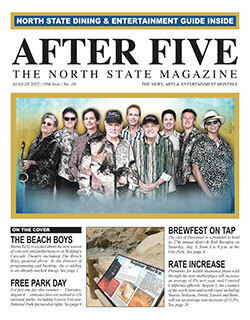 After Five is published monthly for the communities in northern California. Founded October 28, 1986. Advertising policies: The subject matter, form, size, wording, illustrations and typography are subject to the approval of After Five. Because a product is advertised in After Five does not necessarily mean we endorse its use. Display advertising rates and more detailed explanation of our ad policies are available on request. The entire contents of After Five are copyrighted. Editorial portions of the magazine may be reprinted by non-profit organizations. All other reproductions require the express written consent of the publisher. After Five welcomes editorial contributions, suggestions and story ideas from its readers. After Five is not responsible for unsolicited manuscripts. Manuscripts or materials unaccompained by a stamped, self-addressed envelope will not be returned. Space is offered for short announcements and calendar events on a regular basis. Readers should submit calendar items between the 1st and the 15th of the month preceding the month of publication. No phone call submissions; email or regular mail only.. Contact us by email for more advertising information. The most recent issue is posted here as it becomes available. Click on the cover above to access it. Crestline Fire from North State News on Vimeo.